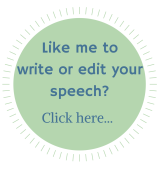 Need Help Writing a Speech? Writing a speech can be tough - and you may have got to the point where you just wish you could have the whole thing written for you. Alternatively, you may feel as if you're 'almost there', but just need someone to look over what you've done. So stop worrying over that speech you've been asked to make and let's get it written! Whether you're writing a speech for a farewell party or have been asked to welcome new members to your organization, I'm happy to assist! Don't see the type of speech you need listed here? Then please contact me anyway using the form at the end of this page and let me know what you need. I'll get back to you within 24 hours to let you know if I can help. Please note - I do not write school/college speeches for which you will be graded. Your custom speech will be written for you from scratch - NOT from a template - so you can be sure your words will be original and your message meaningful. Can't I Simply Adapt a Free Speech from Your Website? 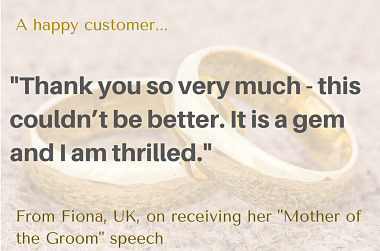 Of course - there are many sample speeches on this site you can use as guidelines for your own and I welcome you to do so. 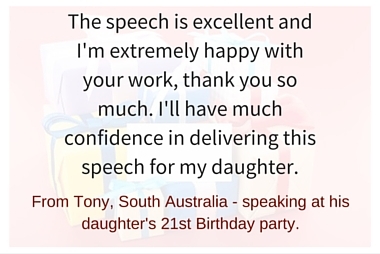 If, however, you don't have the time to create your own speech - or just don't feel comfortable or confident with writing a speech yourself - and you want to deliver your own unique message, then you may prefer to let me do the work for you! This includes an initial consultation via email, any research necessary to complete the task, plus revisions to your satisfaction. (If you require a speech longer than three minutes in length, please contact me using the form below so we can discuss your requirements and pricing). If you have all your ideas on paper and the message you wish to convey but are unhappy with the way it flows, this would be the best option to use. Includes revisions to your satisfaction. If you've written a speech and you're more or less happy with it, but would just like it checked over for grammatical accuracy and flow, select this option. Payment is via PayPal - but please note you do not have to have a PayPal account. Payment can be made via PayPal with a debit or credit card. 50% of the fee is required before work begins, with the remaining 50% payable on completion. Please remember - I'm not happy unless you are! So we will work together to make sure you receive the speech you want. Then please fill out the form below and I'll get back to you within 24 hours.